This week is Anti-Poverty Week, a reminder that more than 36,000 Canberrans are living in poverty. The current minimum wage is not enough to lift all Canberrans above the poverty line, and this has been exacerbated by recent cuts to Sunday penalty rates, and endemic wage-theft and non-payment of superannuation by ACT employers. 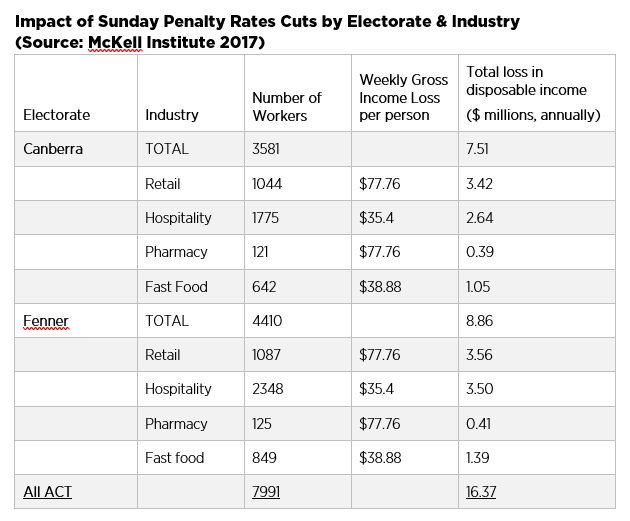 Cuts to penalty rates will only make life harder for 8,000 low-paid workers in Canberra, who stand to lose more than $16.3 million in wages each year, according to research by the McKell Institute. Underpayment of superannuation (a form of wage-theft) exacerbates poverty in retirement. Research from Industry Super Australia shows that each year 45,000 Canberrans have an average of $3,400 of their superannuation stolen by employers through underpayments and non-payment. The cumulative impact of this superannuation wage-theft throughout a person’s working life can cost workers up to $240,000 in lost interest over their working life. “Inequality in Canberra and Australia is at a 70 year high. “Addressing poverty means improving the wages and conditions for working people. “The truth is that thousands of hard-working Canberrans have been forced into US-style working-poverty because of wage-freezes, wage-theft, insecure work and cuts to penalty rates. “The Turnbull Government has waged a war on working people, cutting wages and doing nothing to address insecure work and casualisation.